Here we have a little information about a period when we were organizing actions (2013- Jan. 2014). We have been active since then participating in actions organized by other groups (notably Occu-Evolve). 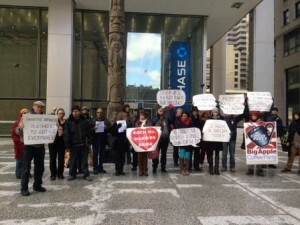 Alternative Banking did have a group participating in the Sept. 2015 Climate March but no one took pictures (as far as I know). We’ve also had meetings at the Left Forum in 2013, 2014 and 2015. 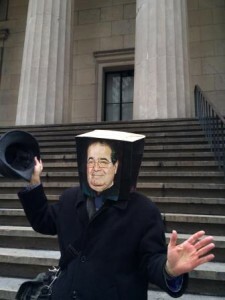 January 18, 2014: We joined Occu-Evolve and other calling for Citizens United to be overturned and a constitutional amendment to end corporate personhood. 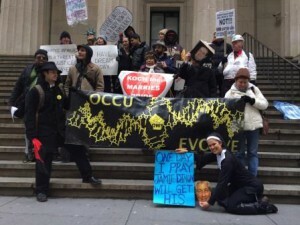 December 4, 2013: We protested in front of JPMorgan headquarters as part of the New Day, New York week of Action events. 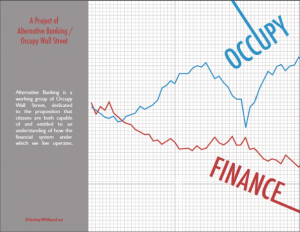 September 17, 2013: As part of the Occupy Wall Street second anniversary, we published our book “Occupy Finance“. It was featured at a press conference in Zuccotti Park, featured on NPR, Bloomberg, FT and elsewhere. and we gave out about 800 copies. 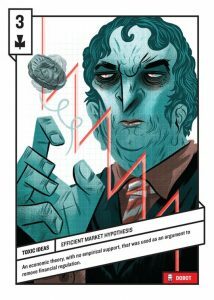 August 29, 2013: We joined HSBC whistleblower Everett Stern and others in bringing public attention to the money-laundering for drug cartels by HSBC and other megabank crimes. June 8, 2013:OWS Alternative Banking holds special meeting as part of the Left Forum. We’ve been there in later years, too, but seem to have gotten camera shy.